Lots of big doings in my kitchen, because, thanks to Riki Shore I am now up to speed on a new method for making meringue cookies. This matters a lot because you never know when the urge will overtake you to stand in your kitchen flipping out lovely little flowers of baked goods all night long while other people tell you about the travails of their days. I was on the search for a super quick cookie that I could add to my list of white desserts for an event at the synagogue where I have spent the balance of my year, dragging baked goods with me, due to the incipient’s bat mizvah. 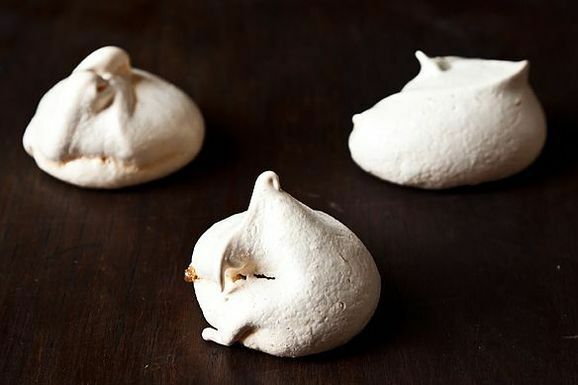 These Chewy Chocolate Meringues can be considered a weeknight recipe, because the ingredients are few and the steps pretty minimal. But they do bake in a low, slow oven for a good 40 minutes per batch so you need to plan for that. I was excited to learn that these cookies are made by cooking the sugar and egg whites together into a syrupy sugar before throwing them into the mixer for whipping into stiff peaks. This is apparently the Italian method and I find it very exciting. Once those lovely peaks have formed, you toss in your chips, pull out your cookie scoop and plop these bad boys out on some parchment paper-covered sheets and cook on. I made these twice and they turned out a bit differently the second go around, for reasons I am not totally clear about. The first batch were snow white and, as the author suggested, delightful crunchy on the outside, with a chewy center. I used mini chips, which offered tiny bits of chocolate surprise that, if you were not careful, fell into your laps as you bit into the delicate sounding cookie. The one difference with my second attempt is that while cooking the whites and sugar, I did not watch and stir as carefully as I should have, resulting in a few bits of scrambled stuff; this may or may not have to do with the fact that I have become obsessed with making a short gimlet and might have been shaking some ice at the time. I just can’t vouch. In any event, they were easily strained away. This recipe yields between three and four dozen, so the cooking takes a bit of time. They can be removed easily with gentle hands, so cool are they from that low oven. People will flock around you to eat them warm, so if you have a chore you’d like fulfilled “No cookie for you until you hang up that backpack/sweep the porch/cut some mint in the garden” call it in. i made mine a bit bigger and they cracked - what does that mean?? also.. when figuring out if they're done, what kind of soft center are we talking about here? If you like cinnamon you can throw cinnamon candies in there after a short burst in the food proccessor just add them..without adding peppermint, with or without the chocolate! Mazel tov to the incipient and the fam. These meringues are also good @ holiday time with peppermint. thanks!!! is that peppermint oil in batter? After I beat the meringue, I added powdered sugar and peppermint oil. Also added some red food coloring to make it more festive. Got the peppermint idea from the junior mints recipe you recommended. Meringues just don't float my boat. Are they really that good? What am I missing? ?